If you know me by now, you’ll realize that most of the time, anything with chocolate in it gets a thumbs-up in my book. These cakes are no exception; however, I’m not 100% sold on them. I hate to say that they’re just a glorified brownie, but that’s what mine tasted like (a pretty good one, mind you). Now, I know that I changed up the recipe to suit the number of servings I was after, so that could be the reason. But, my cakes look nothing like what was pictured. They didn’t exactly crack, either. Center a rack in the oven and preheat to 275 degrees F. Generously butter the sides and bottom of 2 mini springform pans. Melt the chocolate and butter, stirring occasionally, in a heatproof bowl set over a pan of simmering water (the bowl should not be touching the water). When it’s smooth, whisk in the espresso. Remove the pan from the heat and gently whisk in the sugar and salt, then add the yolks one at a time. You’ll have a lovely, velvety mix. In the bowl of a stand mixer fitted with the whisk attachment or in a large bowl with a hand mixer, whip the egg whites until they are firm but still glossy. Very gingerly, whisk about one quarter of the whites into the chocolate mixture, just to lighten it. Switch to a rubber spatula and gently fold the remainder of the whites into the chocolate. Scrape one third of the mixture into the buttered pans. Cover and refrigerate the remaining mousse. Bake the cakes for 15 minutes, at which point they will be puffed. Transfer the pans to a cooling rack and let the cakes cool to room temperature – when there’ll be a dip in the center of them. Then chill the bases for at least an hour. Equally scrape the chilled mousse onto the chilled bases. Bake the cakes for about 30 minutes, or until the tops are puffed and dry – it will crack and that’s both fine and attractive – and a knife inserted inside a crack comes out almost dry. Transfer the pans to a cooling rack and wait for 5 minutes, then run a blunt knife around the edges of the cake and remove the sides of the pan. The cake will sink, so just let it settle for another 5 minutes. Transfer cakes to a serving plate and dust will cocoa powder if desired. Yep it was not a fav. over here either! I lOVE your heart shapes though…so cute! I have a brownie recipe that I will stick with too! I always like reading about your alterations! I’m not really a brownie person, but likened this recipe more towards a flourless chocolate cake consistency. However, I like your heart shaped cakes! They almost look like chocolate chip cookie cakes! Yum! I love your two little hearts – adorable! I liked but did not love this too. Jessica–I can completely see how they are a bit brownie-esque. 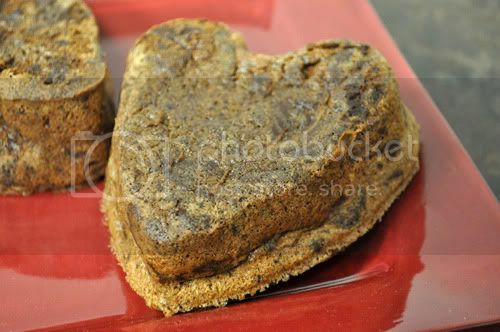 The one that I put in the fridge overnight was, to me, much more like the flourless cake yummychunklet mentioned. But, those are gorgeous and I love the heart shapes! I love the hearts! This wasn’t my favorite recipe, but I am definitely enjoying seeing everyone’s different presentations of the same cake! I agree — it really was more like a brownie than a cake. And the mousse seemed more like batter than mousse to me. Not a homerun, but it tasted OK. I love the hearts – they would be perfect for a Valentine’s Day Treat! I love the hearts, Jessica! Mine tasted much differently than a brownie. Interesting to read and see everyone’s opinions on this one. Oooh! Admire your creativity! They look fantastic! It was more like a thin fudge. Tasty tho. Not sure if I did it right, but as long as it tasted good…. The hearts are so cute – and it’s so interesting how the texture is totally different from mine! I wonder why yours didn’t crack? I loveeeee hearts and loveeeeeee urs , so pretty! 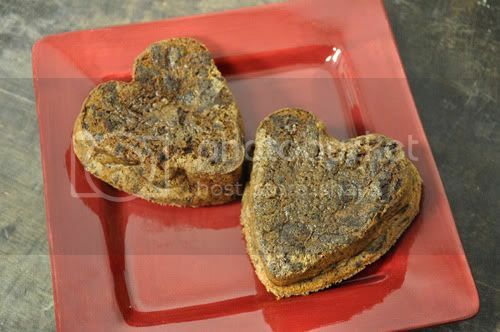 I had mine warm, so I didn’t catch the brownie likeness… Love the heart shaped pans though! Sorry this wasn’t a hit for you. Sorry these didn’t turn out the way you expected. But I love the heart shape. Next post: Third Blogiversary Giveaway Winner! !